Her Royal Highness Princess Basma Bint Talal of Jordan delivered the final lecture in the special series held as part of the University's celebrations for the Millennium on 2 May 2000. 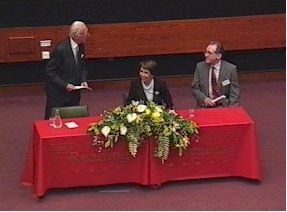 Entitled Into the Millennium, the series featured a broad spectrum of political, aesthetic, scientific and environmental issues, given by Honorary Graduates of the University of Reading who are distinguished in their field. The princess was awarded an Honorary LLD at Reading in 1998. HRH Princess Basma, who is the sister of the late King Hussein of Jordan, spoke on the theme of Human Development. For more than 20 years she has worked nationally, regionally and internationally to promote a range of global issues, most notably in the areas of human development, gender equity, and the well-being and development of children. She plays an active advocacy role through various forums such as the United Nations and is particularly dedicated to the implementation of sustainable development programmes that enhance the social and economic well-being of marginalised groups.